I always get asked if I know any easy, raw desserts that can be good for the holidays. My two-year-old son really likes this recipe for gingerbread chia pudding. It has become a holiday staple for us. It’s really easy and delicious. Changing recipes for the holiday season is all about using the base recipes and then just changing and experimenting with the spices and seasonings! Have fun with it! 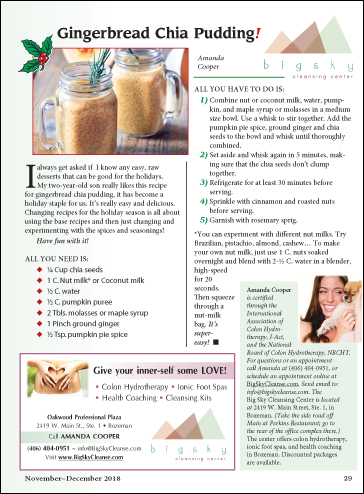 *You can experiment with different nut milks. Try Brazilian, pistachio, almond, or cashew… To make your own nut milk, just use 1 C. nuts soaked overnight and blend with 2-½ C. water in a blender, high-speed for 20 seconds. Then squeeze through a nut-milk bag. It’s super-easy!